As the sun shines a bit brighter, the days last a bit longer, and the humidity rises, you’ll find yourself at sporting events, backyard BBQs, and on the beach more frequently than usual. And while your kids may not want to slow down during a day of frisbee, baseball, and playground antics, you’ll need to be watchful of them to make sure they’re maintaining adequate hydration. While some children may prefer the taste of fruit juice, soda, or sports drinks over drinking plain water, these beverages are not ideal options for combating dehydration. They each contain a high amount of processed and refined sugars, often in the form of high fructose corn syrup or cane syrup, and caffeinated sodas are likely to hinder hydration, as they act as diuretics. The American Academy of Pediatrics recommends six glasses of water each day. But when children are outdoors and active in hot weather, that recommendation increases. Children weighing 88 pounds should be given 5 ounces of water every 30 minutes, and children weighing 132 pounds should be given 9 ounces of water every 30 minutes. Scale your child’s water consumption based on her weight. Of course, water isn’t the only way to keep kids hydrated and healthy. Feeding your kids food that has a high water content during the warm weather can aid in hydrating them, and are often an easier sell than water! Strawberries are 91% water, and, as a bonus, contain vitamin C and folate. Plus, you’d be hard pressed to find a kid who doesn’t love these juicy berries. 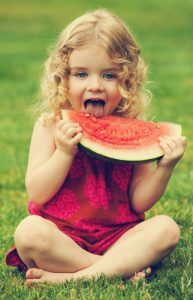 Watermelons are another hydrating fruit that kids love. Watermelon is 92% water, and rich in antioxidants including lycopene. You’ll want to have slices of this kid-friendly treat on hand all summer long. For an extra cool-down, puree watermelon and freeze it in popsicle molds for a healthy, no sugar added popsicle! Want to work some veggies into your child’s diet? Cucumbers clock in at 95% water and most salad greens check in at 90%. Combine them into a fruity salad your kids will gobble down without noticing the veggies. We like cucumbers paired with tomato, watermelon, and feta cheese, or a spinach salad with strawberries. Choose organic veggies that are free of harmful pesticides, richer in nutrients, and are eco-friendly to boot! 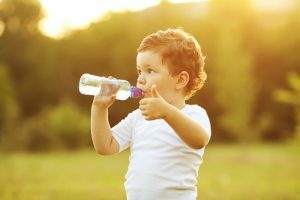 You’ll want to be sure to watch out for signs of dehydration, and to hand your children a bottle of water before any signs of dehydration show up. Even if your child is not thirsty he should have a drink of water, since thirst is a sign that dehydration is already underway. Mild dehydration symptoms include increased thirst, slightly less activity than usual, less frequent urination, and dry lips. Hydrate your child immediately upon noticing these symptoms. If your child is lethargic, his eyes are dry and sunken, the inside of his mouth is sticky, and his heartbeat is rapid, call a doctor right away. These are advanced symptoms of dehydration. Keeping your children adequately hydrated during the summer months will ensure that they stay active, stay alert, and feel good as they pass the time on the beach, the ball field, or the playground. Be vigilant and be firm about giving your kids what they need to avoid dehydration. If your child tends to dehydrate quickly, let your daycare or preschool know. While they are already providing kids with extra hydration during outdoor activity, they can pay special attention to make sure your child remains safe and healthy.